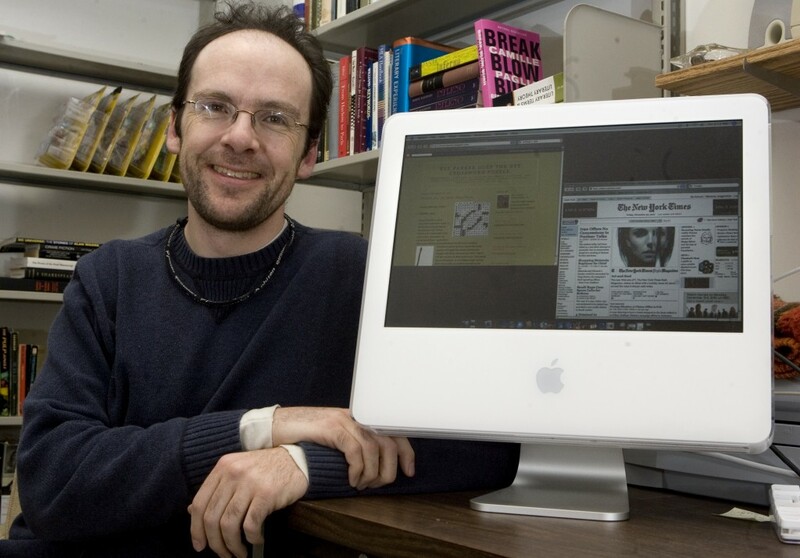 Photo provided Michael Sharp, an assistant professor of English at BU, is a master of New York Times crossword puzzles. He solves crosswords under 15 minutes every day and blogs about his experience and the content of the puzzles. Michael Sharp leads a double life, much like some of the masked vigilantes he discusses in his “Comics” class. By day, he teaches two sections of British Literature I and a class on comic books for Binghamton University’s English department. By night, he is Rex Parker, renowned blogger and New York Times crossword puzzle solver. Sharp, an assistant professor of English at BU, solves the Times crossword every day, taking anywhere from three minutes or fewer to complete the easiest puzzle of the week on Monday to 15 minutes on the more-difficult Friday and Saturday puzzles. He generally begins the puzzles as soon as they are published on the Times website, normally at 10 p.m., and publishes a blog post by midnight. His blog provides an in-depth discussion of the daily puzzle, including what he liked or disliked about its clues, answers or structure. He also blogs about what he was thinking while filling in the grid and provides trivia about the various words that appear in the puzzle. Every blog has an image of the completed crossword from the day it was published and an assortment of media, including YouTube videos and pictures to create an interactive and entertaining presentation. Sharp began blogging in 2006 under the pseudonym Rex Parker, an arbitrary alias invented by his family while they were on vacation in Hawaii. The name has since become a critical part of his online identity. His first blog, “Rex Parker Does the NY Times Crossword Puzzle,” was initially meant to be a temporary experiment in blogging, through which he could learn the skills necessary to develop a second blog that would act as a supplement to his comics class. The comics blog never came to fruition, but Sharp’s crossword blog has amassed significant recognition over the past five and a half years. His blog has been featured on “Jimmy Kimmel Live,” The Wall Street Journal and fittingly, in The New York Times itself. Daily posts often receive up to 150 comments from his enthusiastic readers. Sharp began doing the Times’ crosswords as a distraction during his senior year of college, and then more regularly during his graduate studies at the University of Michigan. In the 15 years since Sharp began doing the crossword, he has carved a place for himself among the crossword elites. He placed 31st out of more than 600 competitors in the American Crossword Puzzle Tournament, and second in the New York division of the American Crossword Puzzle Tournament. He has even constructed his own puzzles, three of which were published in The New York Times, two in The Los Angeles Times and one in The Wall Street Journal. But Sharp said that his is not a skill that comes easily. He said that in puzzle solving, like most things, practice leads to success. Over the years, Sharp has developed a sense of what makes a strong crossword and what makes a puzzle flounder. For him, a good puzzle is one that is surprising and contemporary. He said puzzle crafters can get lazy. Despite the amount of time and effort that he has invested in crosswords over the years, Sharp said his life as a blogger and his life as a professor are separate. Kellan Potts, a senior majoring in English and a student in Sharp’s British Literature I class, said that he can see traces of Sharp’s wit and humor in his teaching style. Josh Lefebvre, a sophomore majoring in English, said he values Sharp’s work.